The seven stories are all set in Alaska and mostly involve young women coming to terms with life in a place that both inspires and challenges them, often in remote or socially isolating circumstances. The book title comes from an essay by Eudora Welty, one of Nancy’s favorite writers at the time (and always! 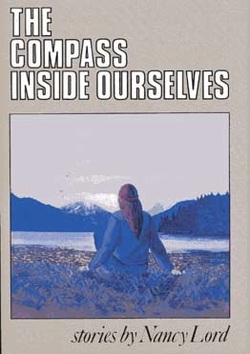 ), who, in writing about the sense of place, encouraged Nancy to think about her own “compass,” which she found aimed at her adopted Alaska home, and the opportunities for creating a literature that might someday speak to place as powerfully as Welty and others have spoken to and of the South. In addition to the book’s publication, part of the prize for winning the contest was a reading and publicity tour of Anchorage, Fairbanks, and Homer, Alaska with Stanley Elkin. Nancy is indebted especially to Jean Anderson who, as a volunteer with Fireweed Press, coordinated the entire project. Nancy credits the contest and book publication with encouraging her to take writing more seriously and to enroll in an M.F.A. writing program. (She had not formally studied writing previously.) She has often said that writing got a lot harder after she realized she was supposed to think about point of view, character development, metaphor, etc. as opposed to the intuitive writing she relied upon in her first stories. The Compass Inside Ourselves had a print run of 1250 (1200 paperbacks and 50 hard covers intended as review copies) and has long been out-of-print. Used and collectible copies are available at amazon.com and from other used book dealers.